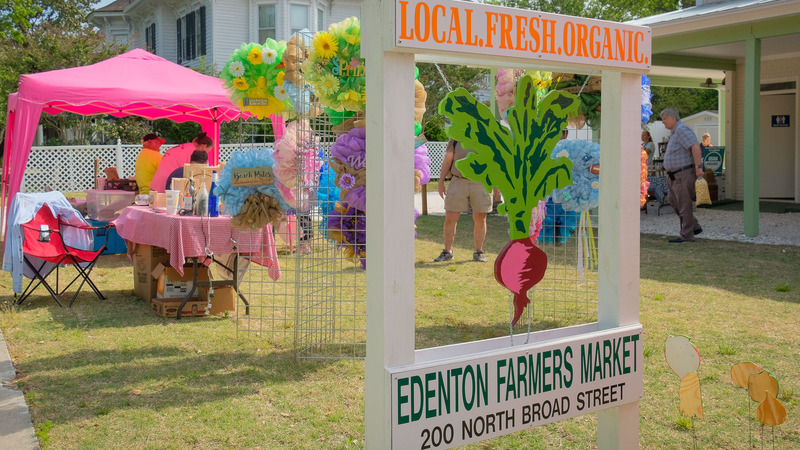 Destination Downtown Edenton, Inc. is an award-winning, non-profit downtown revitalization organization that works to promote and preserve downtown Edenton as a desirable destination to live, work and visit. Highlighted by the banks of the Albemarle Sound, Historic Edenton was the first Colonial Capitol of North Carolina. Edenton was incorporated in 1722 and is the second oldest town in the State. Today, history comes alive in Edenton with our extensive historic district, two National Historic Landmarks, and lavish homes embracing many architectural styles. Our downtown district offers style and diversity with charm. Make downtown Edenton your next shopping and dining destination! Our thriving Farmers Market has a new home at 200 North Broad Street! Open every Saturday, year-round, 8am-noon and Wednesdays, April-November, 3pm-6pm. Lots of fresh fruits and vegetables, seafood and meats plus delectable cheeses, breads, and lots more. SNAP/EBT and all major credit cards accepted. For more info call 252-209-4792. Edenton’s Main Street was named one of North Carolina’s Great Places by the NC Chapter of the American Planning Association. 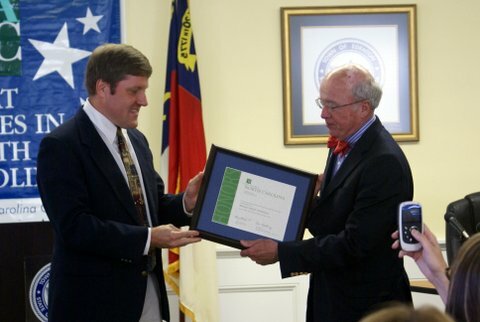 Representatives from the NC APA presented Mayor Roland Vaughan (right) with the NC Great Places Award. Destination Downtown Edenton submitted the application and made a strong impression on the evaluators. The competition netted more than 75 nominations from across the State for great main streets. In reviewing the submissions the panel of experts felt that Broad Street in Edenton really stood out as a main street that is attractive, interesting and alive. They were particularly impressed with the combination of historic architecture, the beautiful setting and the tremendous vitality that our downtown has in providing a dynamic central gathering place that residents and visitors enjoy. Mayor Vaughan thanked the Chapter for recognizing and placing value on good strong planning, and talked about the Town Council’s commitment to professional planning and its support of Destination Downtown Edenton. Edenton was named one of America’s prettiest towns by Forbes Magazine! And they chose a photo of our beautiful waterfront as the opening for their online slideshow! Copyright © Destination Downtown Edenton, Inc.